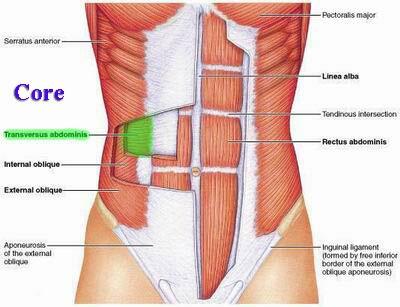 When you hear the term “core,” abdominal muscles may immediately come to mind. However, the core actually comprises much more than just the abs. The core includes all the deep and superficial muscles used to stabilize, align, and move the trunk of the body as well as the pelvis and hips. The core is where the body’s center of gravity is located, and is the root source of all movement whether we’re talking about trunk movement or movement of the extremities. A strong core sets you up for fitness success, while a weak core puts you at risk for injury. Beginning a workout program with a weak, unstable core is like building a house without a foundation! Sooner or later, all the careful work you put into building your house may come crashing down around you. In this case the crash will be in the form of suboptimal movement, postural problems and possible injury. Even if you’re one of the lucky few who skip core stabilization exercises and don’t end up with injuries, your functional strength, power, and endurance will never be what they could had you first developed a more stable core as a basis for operation. Jump Down to the Exercise Videos or continue reading to learn more. Why is Core Stabilization Even More Important than Core Strength? As stated above, strengthening the core before ensuring its stability doesn’t really make sense, as you are failing to lay a solid foundation. You may experience more immediate gains in strength and physical appearance, but you’ll be kicking yourself later if you are like many exercisers who get injured and have to backtrack to do remedial work they should have done in the first place. Rushing those 6-pack abs just isn’t worth the risk. Stabilize first and strengthen second! The goal of a sound core training program should be to systematically stabilize the core through core stabilization exercises before graduating to strength and power exercises. Core stabilization training consists of simple yet effective exercises mostly involving isometric tension, with little motion through the spine and pelvis. This strategy serves to improve intervertebral stability and enhance neuromuscular control. In this way, the spine is protected and the deep muscles of the core are better prepared in terms of strength and coordination for the more demanding ab exercises to come later. What Problems are Caused by an Unstable Core? An unstable core causes forces to be transferred improperly during exercise as well as day-to-day activities of living. This leads to compensatory movement patterns in which the wrong muscles are recruited for movement, as well as postural problems which are associated with a whole slew of problems of their own. Additional issues linked to a weak core (and thus correctable through core training) include lower extremity pain, hamstring strains, adductor pain, IT band syndrome, and the dreaded lower back pain. People who train their core properly will experience relief from symptoms as well as decrease their chance of recurrent injuries, preventing initiation of the cumulative injury cycle. Sadly, a whopping 80% of the adult population experiences chronic lower back pain (LBP). In a great many cases, a weak, unstable core is the hidden cause. People with LBP may greatly benefit from core stabilization exercises, experiencing relief of symptoms and improved quality of life. Core training provides better relief from and prevention of lower back pain than manual therapy such as massage or chiropractic work, traditional medical management, or other common exercise prescriptions alone. What Muscles Are Used to Stabilize the Core? The core is also known as the lumbo-pelvic-hip-complex (LPHC). The LPHC includes the lumbar spine, the pelvic girdle, the abdomen, and the hip joints. The core musculature works together to stabilize and move these areas directly, while providing support for all other body movements. At the deepest level, the spine is stabilized by muscles which attach directly to it, including the multifidus, transversus abdominis, internal obliques, diaphragm, and pelvic floor muscles. These muscles are primarily used to control posture by stabilizing and protecting the spine itself. One level up are the muscles which attach the spine to the pelvis, including the quadratus lumborum, psoas major, external obliques, rectus abdominis, gluteus medius, and leg adductor complex. These core muscles transfer force between limbs and the core while providing stabilization and control of the core during dynamic movement. The most superficial muscles involved in core stabilization attach the spine and pelvis to the extremities, producing force and providing stabilization during movement. The superficial muscles of the core are the latissimus dorsi, hip flexors, hamstring complex, and quadriceps. Taken on their own, these superficial muscles do not directly stabilize the core; rather, their interdependent relationships with other muscles enhance core control and stability. There are two simple moves that you can do to enhance the stabilization aspects of the three core stabilization exercises described below. The first is the drawing-in maneuver, in which you draw the area just beneath your bellybutton in toward your spine. This recruits the deep stabilizing muscles. The second maneuver is the bracing maneuver, commonly called “bearing down,” in which you consciously contract the abs, glutes, and spine muscles. This recruits the mid-level core muscles to provide greater stability to your movements. Perform these maneuvers during the raising, holding, and lowering parts of the three exercises below. The National Academy of Sports Medicine (NASM) recommends the following three exercises for optimal core stabilization. During all of these exercises, focus on slow, controlled movements demonstrating optimal alignment and form. Lie on your back on the floor with your knees bent, feet flat on the floor, and arms stretched out to the side at a right angle to your trunk for support. Draw in and brace, especially in the glutes, while lifting your pelvis and low back off the floor slowly, peeling up one vertebra at a time. Be careful not to hyperextend your spine. Hold for a few seconds, and then slowly lower down one vertebra at a time. Lie on your stomach on the floor with your feet together and your forearms on the ground. Lift up into the plank position (onto your forearms and toes). Focus on being straight as a board from head to toe. Keep your chin tucked down and your back flat and neutral. Don’t forget to draw in and brace! Hold for at least 2 seconds, then lower down. Note: If you have access to a stability ball and a good level of control over the plank exercise, you can perform it on a ball for a greater challenge to your stabilization system, as demonstrated in the video. Lie on your stomach on the floor with your arms at your sides. Contract your glutes and move your shoulder blades together. Keeping your head and chest aligned, lift your head and chest off the floor, looking down with a tucked chin. Lift the arms a bit as well, pointing a “thumbs up” sign off to each side. Keep your feet on the floor! Hold for 2 seconds, then slowly lower back to the floor. For optimal results, perform at least two sets of these three exercises at least three times weekly for a total of four weeks. If you find the two-second hold to be too easy, hold for longer as the month goes on, and also add more sets. After four weeks, your newly stabilized core is ready to perform more demanding strength exercises safely with minimal risk of injury. Check out our Ask the Trainer Core Exercise Videos for more options for core stabilization as your stability levels increase. Once you’ve completed the basic stability program described above, try the exercises on the Ask the Trainer Abdominal Exercise Videos page to start carving out that 6-pack. I hope I have convinced you to invest in your fitness future by optimizing your core stability here and now. You’ll definitely thank yourself later when you reap the benefits of postural improvements, decreased injury, and heightened athletic performance associated with proper core stabilization. 2.) Ebenbichler, G.R., et al. (2001). Sensory-motor control of the lower back: Implications for rehabilitation. Medicine and Science in Sports and Exercise, 33: 1889-98. 3.) Kibler, B.W., Press, J., and Sciascia, A. (2006). The role of core stability in athletic performance. Sports Medicine, 36(3): 189-198.